Demeter’s Greenhouse caught my eye because, well, as of late I’ve had this strange urge to build a greenhouse, grow some tropical flowers and spend some quiet time among plants. Then one of my neighbor’s children will fling a baseball into our yard and probably smash the whole thing up. That is when I realize we need a fence before a greenhouse. So, in lieu of the real thing, I reach for Demeter’s Greenhouse. In Bottle: As tangental as I was in that introductory paragraph, Greenhouse gets to the point a bit faster. Unfortunately that point seems to be, “I smell fake!”. Applied: I’ve been in a few greenhouses growing up. One of my cousins has one in his backyard where he grows vegetables, fruits, flowers and other things that make me jealous because the best I’ve done is a couple of spindly trees and a sick looking fern. Some of my favorite smells is the scent of humidity, moist earth, green leaves with a faint aroma of flowers. That’s not what I get from Demeter’s Greenhouse. I get a synthetic green herbal shock with a dollar store level floral note in the background. It’s not unpleasant, but it’s not greenhouse either. There’s a bit of moistness to the fragrance, but it’s really quite off from the greenhouses I’ve been in. I suppose it’s hard to capture the essence of something that could have such widely varying characteristics, and really, I’m not taking away points because bottled Greenhouse doesn’t smell like my cousin’s greenhouse. I’m taking away points because something in this smells really synthetic. While not unpleasant, I can’t agree that this is a greenhouse. Extra: It wasn’t until my recent move and discovery that not every living plant I touch immediately turns brown did I discover that I actually like gardening. Or at least, I would love to garden. Fence first. Garden after. Real greenhouse someday. In the mean time, Demeter’s Greenhouse isn’t going to cut it for me. Design: Designed simply just like every other Demeter fragrance. Nice simple bottle, not high end or luxe in anyway. For the price point this is pretty much all I expected and if nothing else, the bottles are reusable. I might be ragging on Greenhouse a little too much. Really, it’s okay. Pleasant if I were to push it a little. But to me, it’s by no means a greenhouse smell. Reviewed in This Post: Greenhouse, 2012, Cologne Spray. Le Chevrefeuille, like most of the Annick Goutal’s I’ve tried focus on a light, floral, pretty composition that captures the beauty of light and airy florals as a form of fragrance. In Bottle: Soft honeysuckle with a green citrus composition backing it and a layering of deeper florals that remain mostly in the background. Applied: Green floral and a bit of honeysuckle floating up at the beginning with a really lovely sweet and light floral treatment. This seems like a very nice fragrance to spray on and go about your day confident that your scent will enhance your natural scent as opposed to covering it up or overwhelming it. The honeysuckle and green fades a bit with a jasmine note floating up a bit. The jasmine and honeysuckle work very well together to form this really gorgeous green, sweet, light floral. The dry down is not much different from the midstage with a stronger jasmine note and a fading honeysuckle scent. Extra: Le Chevrefeuille was released in 2002 and was composed by Isaelle Doyen (Annick Goutal’s Le Mimosa and Songes) and Camille Goutal (Annick Goutal’s Mandragore and Vanille Exquise). Design: Designed in much the same way as other Annick Goutal fragrances. You’re looking at the feminine bottle above with the ribbed glass design and the gold cap with the cute ribbon and paper label. Cute, classic Annick Goutal design. Also one of the lesser seen perfume bottle designs where you can unscrew the nozzle and either refill the fragrance or use the bottle for something else. Notes: Lemon, petit grain, honeysuckle, narcissus, green notes, jasmine. I love Le Chevrefueille, it’s just the right amount of light, sweet, and floral that can work very well for all manner of situations and can even be an every day scent. 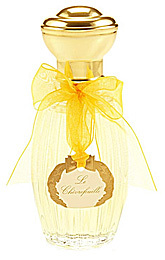 Reviewed in This Post: Le Chevrefeuille, 2005, Eau de Toilette. I hate it when I reach for a sampler, smell something, decide that I love it then find out that it was discontinued or is now incredibly rare. In Cialenga’s case, it was discontinued and now only exists on eBay. Thankfully, the prices aren’t sky high. Unfortunately, supplies will run out sooner or later. It’s such a shame for a fragrance so classically beautiful. In Bottle: Smells rather familiar, like an aldehydes based fragrance but softer. I get the crisp green citrus and the floral notes, most notably ylang-ylang, rose, and lily. Applied: Crispy green opening with some aldehydes rolling in. The aldehyde element isn’t too strong in Cialenga. It adds rather than dominates as it tends to do. The fragrance ages very gracefully into a midstage marked with a prominent rose, ylang-ylang, and lily bouquet that has elements of the powdery, soapy aldehyde composition. The clove mixes in this general area too giving it a bit of spiciness to work with. The fragrance then starts to age into its dry down with a bit of woodsy earthiness coming through and a marked green richness with a hint of powder and spice. Extra: Cialenga, if you get a whiff of this stuff is a really well-balanced and very well composed fragrance that harkened from a time when classical perfumery was still somewhat celebrated. It was released in 1973 by perfumer, Jacques Jantzen. Design: Cialenga’s design reminds me of the 70s but also seems to borrow some design elements from the 1920s or 30s. Something about it is is very Art Deco. Maybe it’s the straight lines. Whatever it is, the design itself is a bit aged but then again, the fragrance is discontinued. It’s not something I’d like aesthetically but it is lovely in a very vintage way. Notes: Citrus, black currant, green notes, iris, jasmine, ylang-ylang, rose, lily, clove, vetiver, sandalwood, oak moss, patchouli, cedar. I can only presume this stuff was taken off the market for its oak moss content. A real shame because Cialenga is a very approachable aldehyde. I can see it as the aldehyde primer for someone uncertain or afraid of the note. Reviewed in This Post: Cialenga, ~1980, Eau de Toilette. 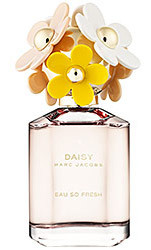 Daisy Eau So Fresh is the 2011 released flanker to Marc Jacobs’ wildly popular Daisy. I was a little leery going into this one because I saw they had taken the fruity floral angle up a few notches. But Daisy Eau So Fresh is actually very nice. In Bottle: Litchi seems dominant with a fresh grassy quality. It’s otherwise a very nicely done fruity scent that reminds me of a fruit smoothie on a hot summer day. Applied: I’m smelling litchi and fruit punch. I’m able to separate the litchi since it’s pretty strong to my nose but the rest of the fragrance is mushed together in this amalgamation of fruits. It’s sweet, a faint echo of Daisy in the brief grassy glimpses I get in the opening as the scent evolves into a fruity floral with the fruits still being the dominant players. As Daisy Eau So Fresh ages it leads away from the fruity opening a bit and evolves into more of a clean floral with a slight powdered quality to it. The dry down is noted with a clean musk and a hint of cedar. Overall, a more pleasant experience than Daisy. And I already liked Daisy to begin with. Extra: Seems like ‘boggling at the advertising’ should be a regular feature on this blog. The ad for Daisy Eau So Fresh said that it was a whimsical interpretation of the original fragrance. I don’t know about anyone else, but if someone had told me to describe Daisy, I probably would have used the word ‘whimsical’ to begin with. How else do you describe a scent that’s supposed to be the smellification (now a word) of a daisy? Design: Daisy Eau So Fresh is bottled in a similar shape and style as the original Daisy. Just think of the original bottle for Daisy, then stretch it out a little so it’s a bit taller, introduce some light dusty pinks, a little pop of yellow and you got the bottle for Daisy Eau So Fresh. I have to admit those rubbery flowers grow on me. Just don’t leave them out for too long because they collect dust like crazy. Notes: Grapefruit, green notes, raspberry, pear, jasmine, rose, violet, litchi, apple blossom, musk, cedar, plum. Overall, I actually think Daisy Eau So Fresh did a good job being a flanker. It smells pleasant enough, easy enough, and if someone liked Daisy by Marc Jacobs they should probably give this a try to see if it jives with them too. Reviewed in This Post: Daisy Eau So Fresh, 2011, Eau de Toilette. Eternity is one of those classic smelling Calvin Klein fragrances with a ton of ingredients that kind of sends em off into ‘meh’ territory for some reason. In Bottle: Spicy carnation with rose and lily notes there’s a hint of citrus up top with a bit of earthiness too. Applied: Citrus opener that follows with a sharp green and clean note that fades away rather quickly to reveal very spicy carnation with a bit of sage and a lily and rose flowery midstage. This stuff smells like a spicy flower bouquet and if you let it keep aging on your skin, you’ll be treated to a woodsier interpretation near the end that falls into a warm spicy and earth fragrance that finishes itself off with a faded carnation note. Extra: Eternity was composed by Sophia Grojsman who also did fragrance such as White Linen for Estee Lauder and Lancome’s Tresor. Design: Eternity is bottled rather simply in a tasteful shape and with subdued design elements. It’s a rectangular glass bottle with a metal topper. Very nicely done, Calvin Klein. But then again, CK has always been pretty good about its bottle designs. Kudos. Notes: Citrus, mandarin, green notes, freesia, sage, lily, carnation, violet, rose, jasmine, lily of the valley, marigold, narcissus, heliotrope, sandalwood, musk, amber, patchouli. I’m not wild about this fragrance for some reason. Maybe it’s because I used to smell this a lot when I was around this one woman who swore by her Eternity and wouldn’t wear anything else. It’s been almost a decade since I was around her but maybe that’s why I feel like Eternity just isn’t exciting to me. You smell a perfume for a certain amount of time and it just ceases to be amazing, I suppose. Reviewed in This Post: Eternity, 2002, Eau de Parfum. Okay, now we’re talking. After three disappointing fragrances in a row, I think a little classic ditty like Calandre’s going to make me see the Paco Rabanne line of fragrances in a better light. In Bottle: Aldehydes and enormous florals. Calandre smells like a classic pretty much immediately. I’m thinking I might associate aldehydes with “smells like a classic” though, so bear that in mind. Applied: Rose and jasmine with those soap aldeyhydes that makes me think “classic”. The fragrance settles down a bit as you let it age but the opening did knock me back because it was quite strong. As Calandre settles down, the mid-stage is an easier to wear and less “punchy” mix of lilies, jasmine, rose, and that omnipresent lingering aldehyde. The soft floral quality of the fragrance shows through more and more as the time passes and the fragrance is less of a punch in the nose and becomes more of an airy breeze. Keep in mind that when I say “airy breeze” when I refer to Calandre, I don’t mean modern perfume, wispy, wilting daisy, and barely there “airy breeze”. Calandre is definitely more pronounced than modern wispy perfumes. But it is light when you compare it to other fragrances such as the heady Guerlain Jicky or Joy by Jean Patou. The dry down is a little bit of a disappointment as Calandre settles into a soft sandalwood with a hint of dirtiness and musk. Extra: Calandre, so far, seems to be the only fragrance from the Paco Rabanne line that I can actually see myself liking. Though it’s a bit of a weak contender when it comes to others in the classics category, it is leaps and bounds more impressive than the more recent Paco Rabanne releases. Design: Remember when Paco Rabanne fragrance bottles weren’t literally designed? By that I mean, you didn’t have a perfume called “1 Million” bottled in a gold brick? Or a perfume called “Lady Million” bottled in a gold diamond? I’m not a huge fan of the boxy, kind of boring, Calandre but it’s definitely a step in a classy direction for a fragrance house that has, so far, rubbed me wrong in the design department. And while I can see the appeal of the literal bottles, I just don’t think they’re my kind of thing. Notes: Bergamot, green notes, aldehydes, lily of the valley, rose, jasmine, iris, geranium, sandalwood, oakmoss, vetiver, amber, musk. Calandre, interestingly enough, is still reasonably available for purchase. I’m not sure if it’s still being produced. If it is, don’t expect that oakmoss note to be real–or even present. If it’s been discontinued then that would explain why a great deal of the bottles are going for $100 or more. Still, a pretty good price for a fragrance that doesn’t smell like anything made today but is also light and wearable enough if you’re afraid of the old classics. This is probably one of the more approachable classics I’ve tried. 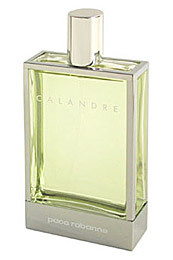 Reviewed in This Post: Calandre, ~1980, Eau de Parfum. I was really wary of trying DKNY Be Delicious thanks to my less than warm reception to DKNY Delicious Night where I pretty much experienced it as a drowning episode in an ocean of sugar. But I tried Be Delicious anyway since a lot of people seem to love this. In Bottle: Synthetic apple. That’s just about all I smell, there’s some sharp little citrus notes in the opening but this stuff is mostly synthetic apple. Applied: More synthetic apple bubbling around up top with a very sweet and sort of cloying personality. Beneath it are some citrus notes that try their best to make themselves known but the apple in Be Delicious is just way too strong for any of that “balance” and “blended” nonsense. The fragrance doesn’t really age well either, I get some floral hints as the wear goes on but everything is being obscured by the big fat apple that’s sitting in the foreground. It’s like I went to see a play and someone that’s wearing an obnoxious hat is seated right in front of me. That’s the apple in Be Delicious. It’s not a good hat. It’s not stylish. It’s just fake and gaudy and loud. The dry down sees a fade on the apple a bit, where I get some florals mixing it up a bit. I would have liked for the apple to go away a lot sooner but hey, I think we’ve established that Be Delicious isn’t my kind of ride and no last minute florals can help that. Extra: So there’s apparently an entire line of Be Delicious flankers that I have yet to try but if I don’t even remotely like the original, I wonder how I’ll do with the rest of them. Probably not well if they’re anything like Delicious Night or Be Delicious. Design: Shaped like an apple. I kind of like how the Be Delicious line is shaped though the construction leaves a lot to be desired. I thought the metallic cap on Be Delicious work in an aesthetic sense far better than the plastic cap on Delicious Night. So the original has that going for it. Notes: Green notes, violet leaf, apple, grapefruit, magnolia, tuberose, lily of the valley, rose, violet, sandalwood, amber, musk. I don’t know where the rest of those notes where. All I smelled was apple and then much later on some rose and lily. 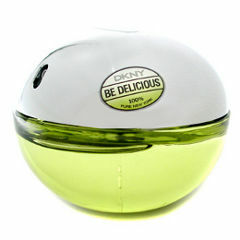 Reviewed in This Post: DKNY Be Delicious, 2010, Eau de Parfum. CK One brings back memories of the early 90s. Where people these days love their Viva la Juicys, the early 90s seemed to be marked with the citrus-y smell of CK One. In Bottle: Opens on a rather tart but very crisp and dewy fruity citrus note. There’s a pineapple in there but it’s not your run-of-the-mill fruity sweet and tropical pineapple. This is tart pineapple and I quite like it. Applied: That clean, green and crisp opening with the tart pineapple and the citrus. CK One takes its citrus and leads into a clean floral mid-stage dominated by lily of the valley, iris and a very potent lemon note that works well to keep this fragrance fresh and clean. The best part of CK One for me is the dry down where the citrus is gone and whats left are florals clinging to clean and diving into a base of tame cedar and sandalwood. I don’t so much smell the oakmoss in this than I smell the green notes that were in the opening. The closer is a green, floral woods. Extra: I remember being a little girl and first smelling CK One. It was at a department store and we had little money at that time for things like this. But I always tried to sneak a smell. I don’t remember if I liked it or not, I only knew that Calvin Klein–at the time–was some fancy brand and one of the girls in my class bragged about wearing this perfume. Design: Very simple bottle. Flat and rectangular with frosted glass. The sprayer is quite uniform-looking too but it’s still an extremely recognizable design. There’s something very utilitarian about this that I love. Maybe it’s the lack of fanciful shapes and colors. I actually like the design, but I think it might be a bit on the plain side. Notes: Pineapple, green notes, mandarin orange, papaya, bergamot, cardamom, lemon, nutmeg, violet, orris root, jasmine, lily-of-the-valley, rose, sandalwood, amber, musk, cedar, oakmoss. CK One isn’t anywhere near as big a deal for me now as it was back then. Still, there’s moments when I smell this and remember sneaking sprays at the makeup counter while my mother and the sales associate gabbed about sunblock. Reviewed in This Post: CK One, 2002, Eau de Toilette. Call me crazy, but I don’t like Obsession for Women. I like the men’s version a bit better but both of them fell off my radar and into ‘Eh, don’t like it and can’t get myself to’ territory. Much like how Poison by Dior ended up there. In Bottle: Warm and spicy, very reminiscent of Opium but not as smooth or as smoky. I smell the animalic in this up front too. Applied: Obsession opens with a slight spray of green citrus which is quickly joined by the civet note. Civet is used well in most perfumes, often as a touch of sensuality and Obsession is no exception. Anyway, after the light citrus and civet open up, the fragrance digs a bit into a fruity jasmine and rose blend dolled up with a lot of spiciness. There must be cloves or cinnamon in there somewhere. Obsession’s projection, by the way, is very good as is its longevity. You’ll be waiting a rather long time for it to dry down but the fragrance dries so naturally into a deeper woodsy floral amping up the civet a little and mingling those spices with a very warm amber quality to it and a slight smokiness that eeks itself into the scene at the very end. 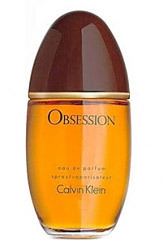 Extra: Obsession was released in 1985 during the crazy trend with oriental perfumes. Design: Obsession’s bottled in a oval glass with a golden liquid inside. The cap is a rich brown shade. The packing looks nice enough and a bottle of Obsession is definitely easy to ID. It’s clean, it’s simple, it’s pretty good. Notes: Green notes, mandarin orange, vanilla, peach, basil, bergamot, lemon, spices, coriander, sandalwood, orange blossom, jasmine, oakmoss, cedar and rose, amber, amber, musk, civet, vanilla, vetiver, incense. Obsession is a well done perfume. I just want to get that out there, I just don’t like it because I believe it’s very similar to Opium and Opium did this concept better which makes Obsession seem rather unnecessary to me. But then, Opium is stronger, so if you liked it but thought it came on way too much, try out Obsession and see if this will work better for you. Reviewed in This Post: Obsession for Women, 2004, Eau de Parfum.